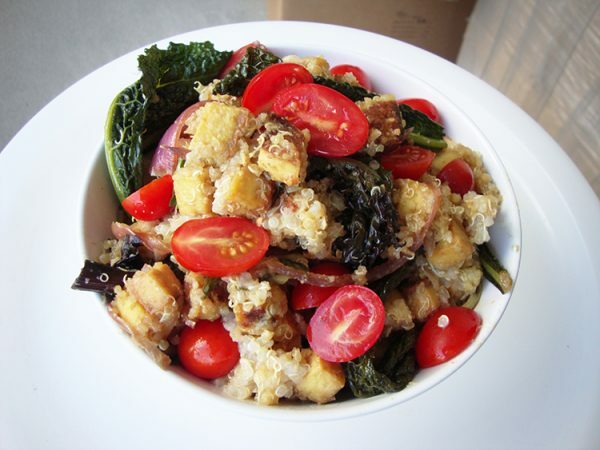 Baked tofu with quinoa, braised greens and mustard dressing. Rinse quinoa, and add water, quinoa and the bouillon cube to a saucepan, bring to a boil, cook for 10 minutes, and then remove from heat. Mix all ingredients in a bowl and keep aside. Preheat the oven to 205°C / 400°F. Cut tofu into cubes and spread out on a baking tray. Coat tofu with olive oil and add garlic powder, onion powder, salt and mix well. Bake for 20 minutes, then turn the pieces over to cook for another 10 minutes to ensure all sides are cooked. Whilst hot, pour most of the mustard dressing and bake for another 5 minutes. In a large saucepan, heat some oil, add onions and garlic over a medium heat and add the braising greens. Cover until desired texture is reached. Add balsamic vinegar and salt, and then stir well. Combine quinoa, tofu, greens, and any leftover mustard dressing in a large mixing bowl and garnish with fresh basil and tomatoes. “The 17th chapter of the Gita clearly defines the nature and tastes of the three types of food eaten by man: the food that promotes love, virtue, strength, happiness and cordiality is Sathwic; that which inflames, arouses, intoxicates and heightens hunger and thirst is Ragasic; the food that depresses, disrupts and causes disease is Tamasic.